Small plumbing issues can quickly plunge into costly disasters. Because of this, we treat every problem as a big deal. 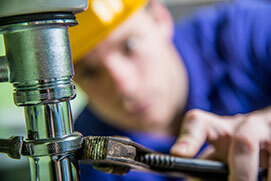 Working tirelessly, our team will help you get a handle on your plumbing system’s wellbeing. And here’s the best part: Our extensive line of services makes us the first (and last) call you need to make. Nobody likes being left out in the cold. Your heater or boiler don’t either. So, rather than letting your system fend for itself, trust us to give it the care that it needs. From performing flawless installations and repairs to adding heating zones, we’ll crank up the heat inside your space for a difference you can feel. A clogged or backed up drain is a clear sign that your plumbing is out of line. But with our help, you can get your space back on track—and keep it there. From taking a closer look at your pipes to uprooting obstructions, our plumbers will restore your space’s flow and drain away your worries—for good. Helping you save a few—it’s just what we do. From seasonal specials to exclusive offers, we offer the best deals around. Dive into our blog for the latest tips, tricks, industry updates and more. See why your neighbors keep choosing us. Your Trustworthy Plumber in Suffolk & Nassau Counties. For many, the greatest thing since indoor plumbing is peace of mind. However, at Ray The Plumber, we know these two gifts come hand-in-hand. You see, when your mind is backed up with concern over your plumbing system’s performance, serenity is nowhere to be found—unless, of course, you turn to us. With over four decades of expertise and an extensive line of plumbing services, our team will drain away your worries in a flush—it’s like a flash, but even quicker. So tap into peace of mind that perpetually flows by turning to Ray The Plumber for all of your plumbing, drain cleaning and heating needs.